National Healthcare Decisions Day (NHDD) is an event that empowers people to discuss and document their advance care plans. In 2017, April 16-22 is dedicated as NHDD week. National Healthcare Decisions Day exists to inspire, educate and empower the public and providers about the importance of advance care planning. We believe that the place for this to begin is at the kitchen table—not in the intensive care unit—with the people we love, before it’s too late. Together we can make these difficult conversations easier. We can make sure that our own wishes and those of our loved ones are expressed and respected. 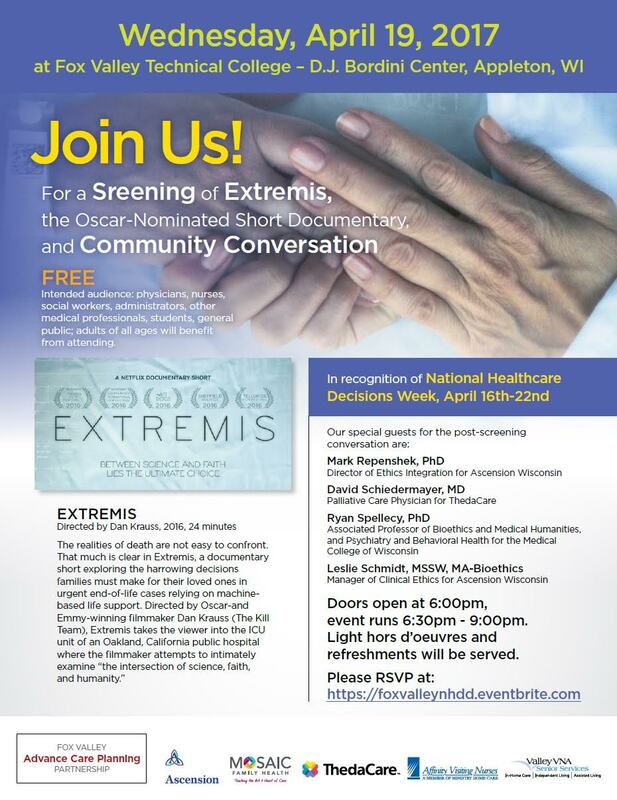 Join other healthcare providers from the Fox Valley and beyond for a screening and community conversation of Extremis, an Oscar-nominated short documentary about the difficult decisions that families must make for their loved ones at the end of life.